Footage of mounted officers leaving Goulden Street Police Station in the early 20th Century. Our Friends The Police [extract - Mounted Police] from NWfilmarchive on Vimeo. 24th Sept 1868 LUSC meeting 11th June for suitable site for new Fire & Police Station for B Div instead of Swan St. 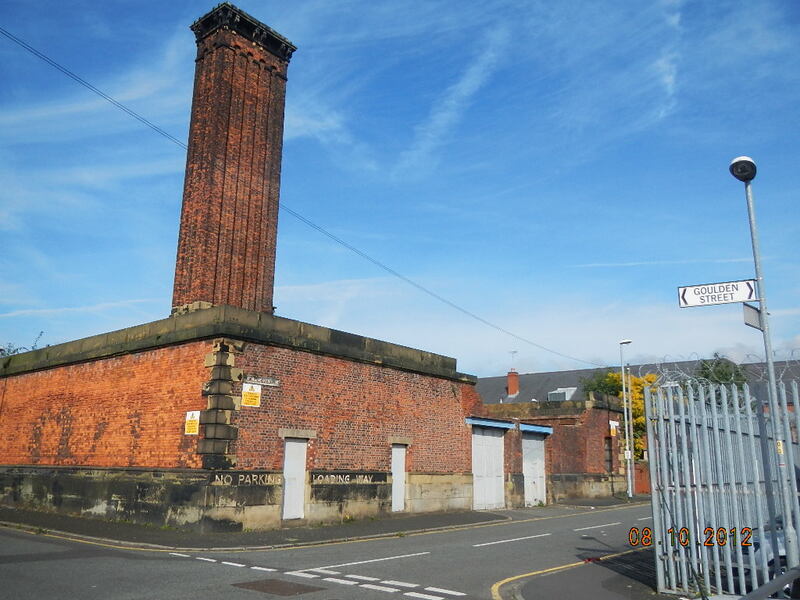 Most suitable site being at Goulden/ Croft/ Bennett/ Chadderton Streets 1530sq yds. Owned by Hulme Charities Trustees on 99yr lease with 48ys to run. Requires Act of Parliament to buy 999yr lease at £90 p.a rent. 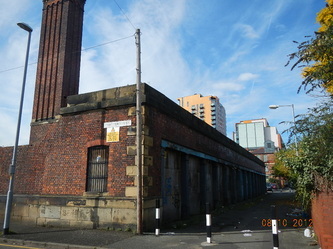 Aug 5th 1869 To purchase land under M/cr Corp waterworks Imp Act 1869. 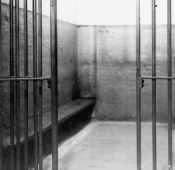 C.Cs requirements: 20 cells, spacious hall or parade room, a charge office, a reserve room, one store room for police clothing and one for misc property. F Brigade require 6 married men’s quarters and stabling 7 horses and shed for engine and hand pump. Feb 9th 1870 Approve plans for ‘Bennett St’ and purchase cost for land £3,000. March 19th 1870 Tender approved for £10,275 from Robert Neill & Sons. 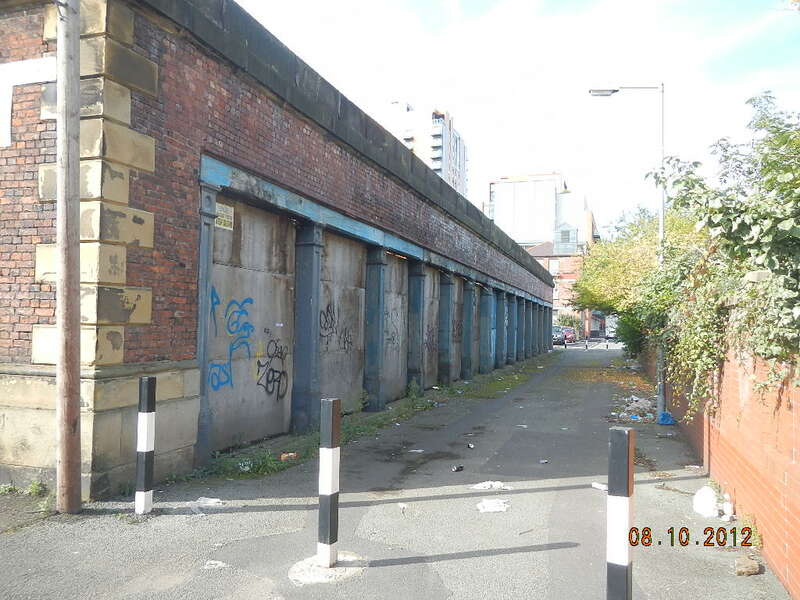 Goulden St station now ready for occupation and offices removed from Livesey 13th next and to sell Livesey St. Site required for suitable auxiliary station in Shudehill/ Oldham St area for A div which has used Swan Street. June 17th 1880 Bigger sign required to be seen from Rochdale Road. July 3rd 1890 New entrance gates with Park Place £45. Nov 27th 1890 Repairs to Lock-ups inspection: £12 required. July 23rd 1891 Twinquennial valuation of properties owned by the W.C only: £10,600. Oct 29th 1891 Boiler repairs. Feb 4th 1892 Painting of Goulden Street £30. 6th Sept 1894 Matrons for female prisoners: the LUSC decide that Goulden St most suitable for the purpose of housing female prisoners. 18th July 1895 The partition walls were up and correct as no noise heard. Painting at Goulden Street now £140. 17th Oct 1895 Application form the Cinderella Club to use the parade ground at Goulden St PS to feed 600-700 poor urchins each week on one night instead of three. 14th Jan 1897 RSPCA use of a room for custody of a horse harness for the use by poor haulers and costermongers etc. This would be very beneficial arrangement. 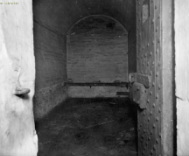 19th May 1898 LUSC: revised drainage and plumbing, reconstruct cell benches and wc’s in cells, improve lighting to cells. Painting in custody areas after plumbing work. 6th Oct 1898 RSPCA continued use for storage of harness for donkeys and horses for poorer costermongers and hawkers. To place a glass roof over the Bridgewater St PS yard and slight alterations to the stables, and with accommodation provided at two stalls at Goulden St, this would provide sufficient accommodation for horses, vans and conveyances for all requirements. 10th May 1900 Single men’s quarters for the Fire Brigade to be created on the ground floor adjoining the duty room. Matron’s pay: Petition lodged for an increase in pay from 14/- to 18/- per week as a matron at the City Court receives 18/- per week but her duties are of a more pleasant nature as her charges are sober when they arrive at Court. 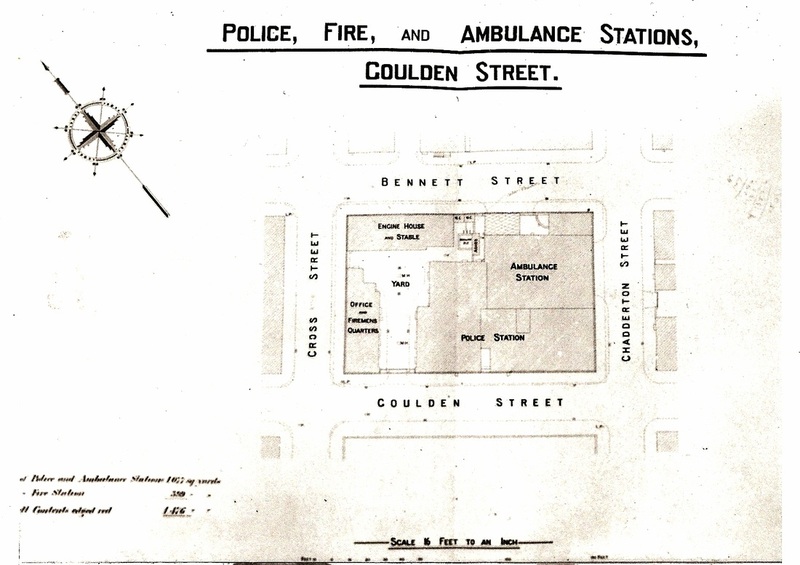 24th July 1900 LUSC: Plans for Goulden St alterations to be submitted. Parade room with ambulance station for three ambulances and horses stabled in rear rapid exit and gates into Chadderton St [see photo gallery]. Four prison vans and ten horses for exit onto Bennett St.
Lamp room - convert into harness room. To convert police stalls into w.cs and manure pit for the Fire Brigade. Upper floor: convert for new parade room, urinal, w.c, accommodation and large hay loft. Saddle room for the mounted police. Access for the new parade room by a new staircase from entrance corridor. 18th Oct 1900 Eight tenders received between £2044 - £2410. 25th Oct 1900 The General Committee say a revised specification and expenses should not exceed £1,500. 20th Dec 1900 Tenders for the ambulance shed agreed at £1521 by James Byron . 7th March 1901 LUSC: The painting of heraldic arms on the horse ambulances was previously done by Mr Crosley at 50/- each. Five horses were also required. Resolved - Painting to proceed. 15th May 1901 Quinquennial Valuations: £8,315 and FB £3,593. 18th July 1901 LUSC: Plumbing work £59. 1.The completion of the work bar the fixing of the mangers and the painting of the window dadoes. 2.The C.Cons to approach the National Telephone Co for the installation of telephonic communication equipment at the ambulance station. 19th Sept 1901 LUSC: Use of the Ambulance Service. Horse ambulances to be stationed at Goulden St PS day and night to convey to the infirmary. Charges to be levied of 7s. 6d per journey or if more than a mile further than the infirmary 10s. Also to convey the ‘wandering and pauper lunatics’ from the City Police Courts to the asylums at 7s 6d, payable to the City Police Fund. 19th Oct 1901 Insurance arranged with the Commercial Union Assurance Co for £3,950 at 2s percent. It is assumed that 2s is payable for 1% of the valuation or £39.10s.0d. 14th Nov 1901 A request by the City Surveyor for another quantity surveyor to do the work. 30th Jan 1902 To check out the work at Goulden St regarding the extras charged by Mr Byron. Dec 1979 Closed operationally - ex PS Martin Miller. 2012 Internal premises now demolished after a fire and only the exterior walls remain as a insecure structure, but the exterior gates and entrances can be identified. Goulden Street Police and Fire station and numerous other Manchester buildings besides.